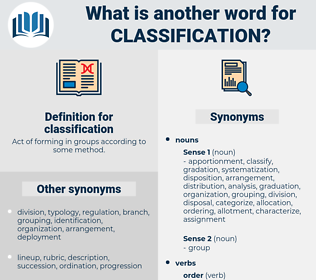 What is another word for classification? Act of forming in groups according to some method. positions, organisms, microorganisms, skills, micro-organisms, qualification, qualifications, sorting, CLASSIF, categorizing, rank, taxonomy, filing, sort, sorts. definitions, listings, groupings, placements, Scales, ranks, files, codes, breakdowns, registers, Records, servants, folders, limits, goods, sorting, sorts. 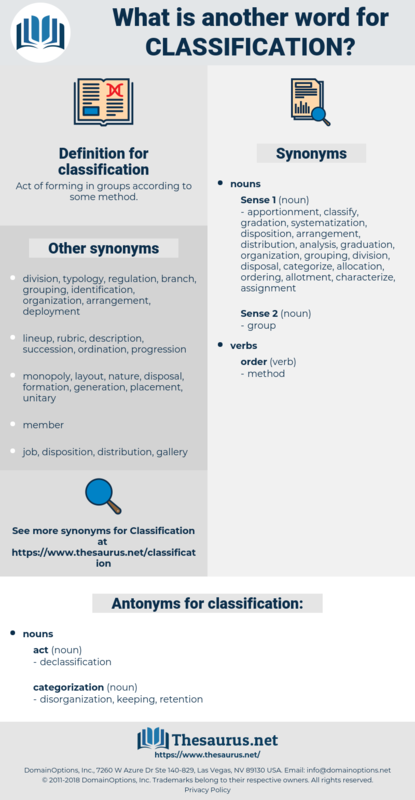 states, grouping, placement, breakdown, allocation, tabulation, inclusion, triage, segregation, clustering, qualification, criminalization, definition, sorting, indexing, distinction, listing, profiling, delineation, categorizing, standing, criminalisation, rank, taxonomy, specification, hierarchy, prioritization, leveling, distribution, taxonomic, filing, catalog, registration, sort, differentiation, codification, closure. listed, continued, sorted, placed, reclassified. categorized, listed, clustered, grouped, Filed, graded, separated, arranged, sorted, broken. ranking, rankings, nomenclature, Nomenclatures, grading, reclassified, rating, ratings, class, Classes. ranking, nomenclature, Disaggregation, grading, rating, division, characterisation, class, compilation. The instances of this are so numerous and so various that we shall find it desirable to attempt a somewhat more detailed classification of them. But on finding that this classification is true only in the most general way, we go farther. reclassification, taxonomy, indexing, typology, relegation, stratification.